NOTA DE INSTINTO SALVAJE: Se ha traducido el afiche al español como un pequeño gesto a la compañera y para adherir a realizar cualquier gesto en solidaridad con todxs lxs combatientes en prisión. Afiche en solidaridad con Aggeliki Spyropoulou, compañera anarquista encarcelada en el caso del intento de fuga de CCF. La compañera fue condenada a 28 años de prisión por su participación en el intento de evasión en el 2015, que consistía en volar una parte de la prisión de Korydallos y liberar a lxs miembros encarceladxs de Conspiración de las Células de Fuego. 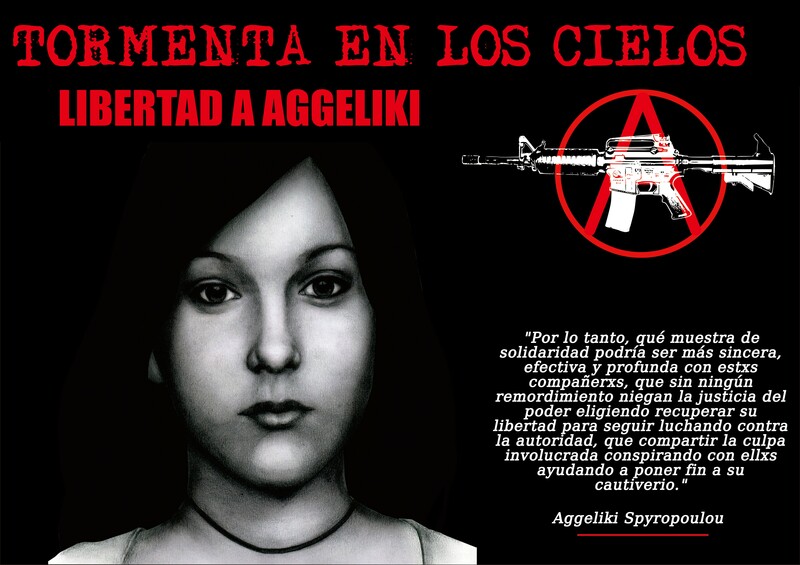 Solidarity flyposter for Aggeliki Spyropoulou, imprisoned anarchist comrade in the CCF Escape case. The comrade was sentenced to 28 years in prison for her involvement in the 2015 escape attempt to blow up part of Korydallos Prison and free the imprisoned members of the Conspiracy of Cells of Fire. My political status and conscience would never allow me to be standing here “apologizing” before a fixed trial-parody as played out recently in this court hall, hence the comments I am about to make will therefore relate to a purely political sphere rather than a procedural one. Political action neither begins nor ends under the Criminal Code, consequently in any case you, both as individuals and as an institution, are not able to judge it. As anarchists, being against the state, we have to oppose the laws that underlie and justify its existence. A game of words forming the collective imagination, elevating the doctrine of “law and order” to the utmost virtue, aiming solely to preserve the existing authoritarian system. The dominant world which you protect and preserve promotes and imposes a structured life, the manifestations of which oppress, enslave and limit the capabilities of human existence. The behaviors, thoughts, feelings, relationships, are transformed into mechanical processes that shape what is called normality or social norm. The lifestyle you suggest to me is summarised to a miserable repetition, specified and without any twists. A boring course of a pointless existence that just waits to be interrupted by death. But I do not fit into your world. I can not stand this perfectly organized boredom. The new day is to bring you face to face with the reality and the time has come to make your choices… I have chosen to live rather than to survive… Instead of the safety of normality, I have chosen to begin a journey into the unknown where every single moment conceals its own surprises. Where the tension comes to replace the weakness. There is one goal; to maximize the threat, to create a dangerous internal enemy that will strike at the heart of your system. This journey is lonely and often you are confronted with your own self, with your own personal contradictions. This is a war that starts from within yourself and surges impetuously against every expression of your modern civilized world. In this war that as anarchists we have declared against you – and we have not refused it a minute; there are no neutral attitudes. The comrades of the Conspiracy of Cells of Fire, despite their long captivity, they did not retreat. They refused to bow down their heads and embrace the cross of remorse. They defended with all their powers and with dignity their anarchist substance. While, therefore, I am not a member of the Conspiracy, our common political conscience allies us. We share the same values, the same ideas and the same passion for freedom. The political bonds that link us could not but make me stand beside them with solidarity. Solidarity is not just an emotionally charged word. Solidarity carves insurrectionary directions and prevents forgetfulness from becoming the tombstone of the captured comrades. At this point is when guilt is born. What could be a more authentic and sincerest manifestation of solidarity to these comrades than to contribute morally and practically to the breaking of their captivity? I can only feel proud that I participated in the attempted escape of the Conspiracy of Cells of Fire and no court is competent to judge my choice. For these reasons, and for all the reasons in the world, I proudly and without a trace of remorse, undertake the responsibility for my practical political contribution to the Conspiracy of Cells of Fire escape plan. No matter how many times I would turn the clock back I would make the same choice again and again. Imprisoned anarchist comrade Aggeliki Spyropoulou was sentenced to 28 years in prison for her involvement in the 2015 escape attempt of the Conspiracy of Cells of Fire. The comrade will shortly be transferred to Thiva prison from Korydallos now that the trial is over. Today the presiding judge A. Yfanti gave new meaning to the concept of fast-tracking proceedings. Within 2.5 hours thousands of pages of evidence documents were ‘read’. In normal proceedings such documents would be read to the court word for word as they are supposedly part of the evidence for the hearing. Following the command of the appeal court administration the Golden Dawn trial was suspended so presiding judge A. Yfanti could ‘finish’ the CCF trial, proving once again that the sentences were already ordered before the trial had even begun. The hearing on 31/05 was based on the presentation of witnesses. Once again the presiding judge, A. Yfanti resorted to using dirty tricks with the aim of harming the defendants (the CCF comrades, their relatives and the prisoner Fabio Dusko). The judge urged the prosecution witnesses to reread their statements and try to “remember more things”, however the statements did not add anything of substance to the accusations. The judge attempted to open up a debate about possible “collateral damage” from CCF bombings and used an attack against the taxation office as an example.